The Single UNIX Specification (SUS) is the collective name of a family of standards for computer operating systems to qualify for the name "Unix". The SUS is developed and maintained by the Austin Group, based on earlier work by the IEEE and The Open Group. ultimately gave rise to SUSv4. 3) one standard deferred to another. In 1988, these standards became IEEE 1003 (also registered as ISO/IEC 9945), or POSIX, which loosely stands for Portable Operating System Interface for uniX. In the early 1990s, a separate effort known as the Common API Specification or Spec 1170 was initiated by several major vendors, who formed the COSE alliance in the wake of the Unix wars. This specification became more popular because it was available at no cost, whereas the IEEE charged a substantial fee for access to the POSIX specification. In 1997, the Open Group released the Single UNIX Specification Version 2 .
and was at the core of the UNIX 98 brand . the Commands and Utilities, Issue 6.
and is at the core of the UNIX 03 brand . In 2004, a new edition of the POSIX:2001 standard was released, incorporating two technical corrigenda. 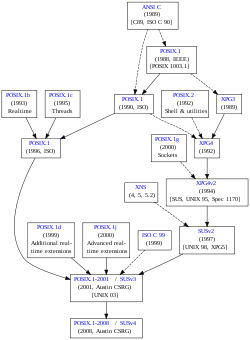 It is called POSIX:2004 (formally: IEEE Std 1003.1-2004) . Mac OS X v10.5 "Leopard" and Mac OS X Server v10.5 "Leopard", released on October 26, 2007, are Open Brand UNIX 03 registered products when run on Intel processors, as are Mac OS X v10.6 "Snow Leopard" and Mac OS X Server v10.6 "Snow Leopard". The last Reliant_UNIX versions were registered as UNIX 95 compliant (XPG4 hard branding). Solaris 10 is registered as UNIX 03 compliant on 32-bit and 64-bit x86 (X86-64) and SPARC systems. Solaris 8 and 9 are registered as UNIX 98 compliant on the same platforms, except that they do not include support for 64-bit x86 systems. No Linux distribution has been registered as SUS compliant.